The 2016 seabird and shorebird nesting season is upon us. As folks head to the beach to enjoy the sand, surf, and fishing, seabirds and shorebirds are gearing up to nest and raise chicks. Biologists ask that beachgoers make a little additional room for these fascinating wildlife species. Nine species of seabirds, including brown pelicans, royal terns, sandwich terns, least terns and black skimmers, regularly nest in South Carolina in large colonies of hundreds to thousands. Shorebirds like the American oystercatcher and Wilson’s plover also nest along South Carolina’s coastline in isolated pairs. Islands and offshore sandbars make ideal habitat for these species that need a place free of predators such as raccoons and coyotes. 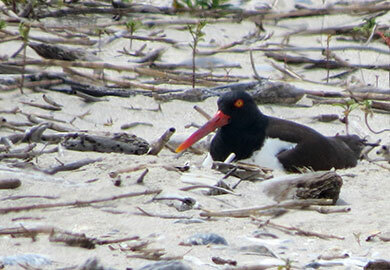 Some species such as American oystercatcher and Wilson’s plover nest on public beaches such as Folly Beach County Park and Botany Bay Wildlife Management Area. 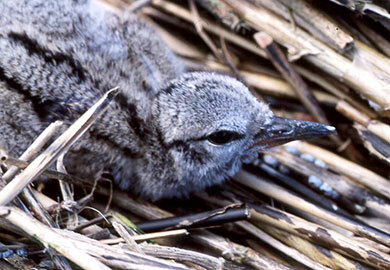 South Carolina supports about 375 pairs of nesting Wilson's plovers. "The majority of Wilson's plovers in South Carolina nest on public beaches, often near inlets," said Felicia Sanders, wildlife biologist with the S.C. Department of Natural Resources (DNR). "South Carolina is important for the survival of the species." Wilson's plovers once nested as far north as New Jersey, but loss of habitat and coastal development have contracted their historical breeding range. Wilson’s plovers have not been recorded in New Jersey since 1955 and were last known nesting in Maryland in 1985. Currently their northern-most nesting state is Virginia, where they are listed as endangered. American oystercatchers also nest on sandy beaches and shell rakes along the coast. These feisty birds actively defend their nesting area and exhibit an animated dance and call when intruding birds enter their territory. Oystercatchers have specialized bills to open shellfish such as oysters, clams and mussels. "Their bills are like oyster shucking knives, and they rely on South Carolina’s many shellfish beds to feed themselves and their young" said Janet Thibault, DNR wildlife biologist. DNR partners with private, state and federal managers to protect about 30 sites for nesting seabirds and shorebirds. These birds make their nests directly on the sand just above the high tide line. Species such as American oystercatcher and Wilson's plovers lay camouflaged eggs directly on the sand. Beach goers could unwittingly step on nests, so DNR staff rope off nesting areas with the help of more than a hundred volunteers and partners. The beach is where these species court, mate, lay eggs, and raise their young. South Carolinians and visitors to the state are encouraged to share the beach with these amazing birds. "We are so lucky they call South Carolina home," Sanders said. DNR also manages several island Seabird Sanctuaries. Deveaux Bank, Bird Key, Crab Bank and Tomkins Island have large pelican and tern colonies. Eighteen percent of the Atlantic population of brown pelicans nest on Deveaux Bank. Due to the sensitive nature of the colonies, portions of Deveaux Bank and all of Bird Key and Crab Bank are closed from March 15 through October 15 to protect breeding bird nests and their young. Tomkins Island is closed year round. Dogs and camping are prohibited year round on these DNR managed islands. For more information on these coastal birds and the work DNR does for these species, check the DNR Coastal Bird webpage. For additional information, contact Felicia Sanders.